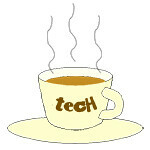 11.11 « Tech bytes for tea? 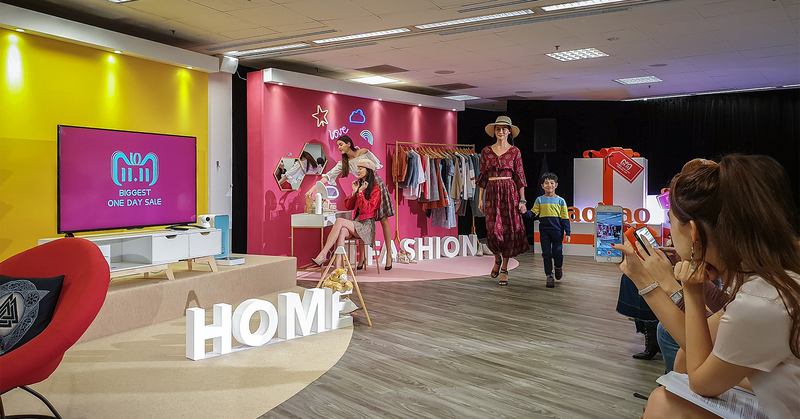 Real estate company CapitaLand tries to capture online shopping revenue in its brick-and-mortar shopping mall by exploring the new “phygital” multi-label concept store, NomadX, that it launched today at Plaza Singapura. Launch of the NomadX “phygital” concept store in Plaza Singapura. In its effort to recapture revenue that has been eroding from traditional brick-and-mortar shopping malls and lost to online shopping websites, the new concept store will attempt to channel back part of these revenue to the physical shops. The 11,000-square-foot space debuts physical outlets of online retailers including Alibaba’s Taobao, Digital Fashion Week and Style Theory. 11,000 sq ft of shopping space on 2 floors of Plaza Singapura. NomadX is spread across two floors in Plaza Singapura, with an attractive frontage facing Orchard Road. 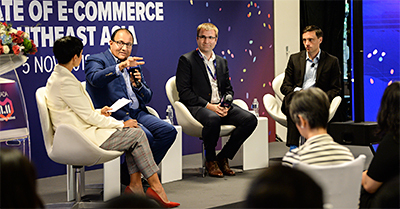 At its prelude to Lazada’s 11.11 online shopping festival, the Alibaba company hosted a panel discussion on the state of eCommerce in Southeast Asia with S. Iswaran, Minister for Communications & Information, Minister-in-Charge of Trade Relations. Lucy Peng, Chief Executive Officer, Lazada Group, at the Lazada 11.11 launch event. Lazada Group also announced that it will support eight million eCommerce entrepreneurs and small-medium enterprises (SMEs) in Southeast Asia to grow and thrive by 2030. 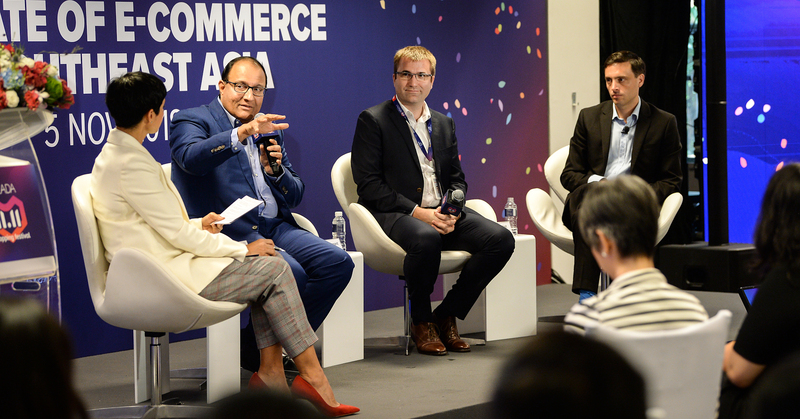 Members of the panel discussion included S. Iswaran, Minister for Communications & Information, Minister-in-Charge of Trade Relations; Pierre Poignant, Executive President, Lazada Group and Simon Baptist, Global Chief Economist, Managing Director, EIU Asia. The company committed itself to create an inclusive and sustainable eCommerce ecosystem in the region and champion opportunities in technology and logistics infrastructure to benefit its ecosystem of sellers, consumers and local communities. “Bargain-hunters are also fun-seekers. Shopping doesn’t have to be boring and our business is not just about offering discounts or a one-off deal. So we are introducing games for shoppers to have some fun while browsing, buying and getting discounts – and they are loving it. Our focus is about building a great shopping experience. It’s the heart to everything we do and what makes an eCommerce operation vibrant,” said Jing Yin, Co-president, Commercial, Lazada Group. As part of the pledge, Lazada will assist SMEs to digitise their businesses and gain better access to Internet-savvy and mobile consumers; make it easier for sellers to create their own brands on Lazada; while leveraging the company’s logistics network to facilitate the transfer of goods. The event is a prelude to Lazada’s 11.11 Shopping Festival which will offer a full customer shopping experience for shoppers in Indonesia, Malaysia, the Philippines, Singapore, Thailand and Vietnam on November 11. Lazada boasts that shoppers can look forward to more than 50 million deals, including discounts of up to 90% on more than one million items during the 24-hour shopping spree. This is the first time that Lazada is participating in the 11.11 Global Shopping Festival together with other Alibaba Group platforms including Taobao and Tmall. The Alibaba Group launched the 11.11 Singles Day global shopping festival in Singapore with more than RMB 10 billion in daily hongbao giveaways. Alibaba launched its 11.11 global shopping festival in Singapore at its Alibaba Visitor Centre at AXA Tower. In the lead up to the actual day on Sunday 11 November, there will be shop coupons, merchant discounts and promos from local partners like Singtel, eatigo, , Kaodim, UOB and Maybank. This year’s marquee shopping event also marks the 10th anniversary of the global shopping phenomenon, first conceptualised by Alibaba Group’s CEO Daniel Zhang. Lilian Wu, SEAsia’s Head of Marketing for Taobao Marketplace & Tmall speaking at Alibaba’s 11.11 launch in Singapore. Held at Alibaba’s Singapore Visitor Centre – its first outside China – the launch also celebrates the Group’s new home in Singapore following its relocation to AXA Tower in the heart of the Central Business District.